The request came shortly after the Trump administration revoked former CIA Director John Brennan's security clearance, citing what White House press secretary Sarah Sanders said was "erratic behavior" and "a series of unfounded and outrageous allegations, wild outbursts on the Internet and television about this administration." To many, however, it was a naked attempt to punish a vocal critic. Brennan himself called it "part of a broader effort by Mr. Trump to suppress freedom of speech and punish critics." 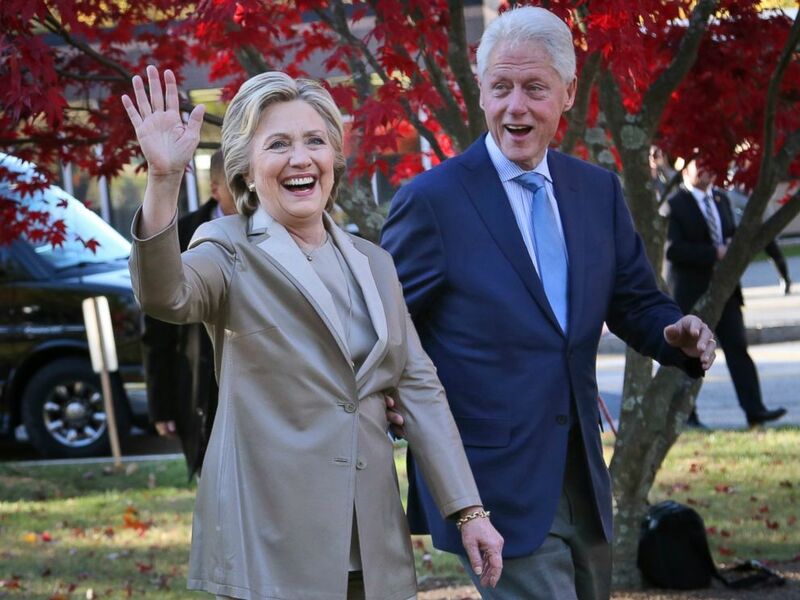 In this Nov. 8, 2016, file photo, Democratic presidential candidate Hillary Clinton, and her husband former President Bill Clinton, greet supporters after voting in Chappaqua, N.Y.
At the time, the White House announced that it was also reviewing the security clearances of other former top officials, such as FBI Director James Comey, Director of National Intelligence James Clapper, National Security Advisor Susan Rice, National Security Agency Director Michael Hayden and Deputy Attorney General Sally Yates. But Clinton was not on the list. The letter also says five other State Department officials, including Clinton's longtime aide Cheryl Mills, had their security clearances withdrawn, too. The names of the other four individuals are redacted, but all five had been designated as "researchers" by Clinton, allowing them to keep their clearance after they left the department. Grassley had asked the State Department last year about the status of Clinton's security clearance and that of her top aides. In 2016, while running for president against Trump, Clinton was investigated by the FBI and the State Department for her use of a private email server while secretary, but she was never charged with any crime, although Comey said he believed she had been "extremely careless." 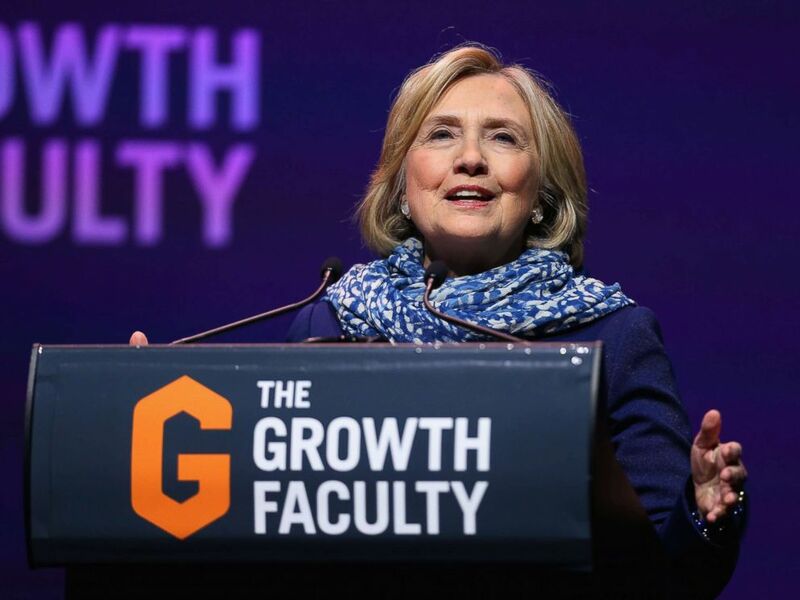 Hillary Clinton speaks during An Evening With Hillary Rodham Clinton at ICC Sydney, May 11, 2018, in Sydney. The department's Bureau of Diplomatic Security will investigate whether any rules or laws were broken by Clinton's staffers after all their emails are reviewed to determine their classification status, according to the letter. Grassley's office released the letter Friday night despite a warning from the State Department not to do so: "We request that you protect the information in this letter, as it is not public and generally not appropriate for public release... Should you wish to disclose any portions thereof, we ask that you provide the Department with a reasonable opportunity to inform the Committee of any sensitive information that should be safe-guarded," wrote acting Assistant Secretary of State for Legislative Affairs Charles Faulkner. The State Department would only confirm that Clinton made the request, referring further questions to Clinton. Clinton spokesman Nick Merrill tweeted about Grassley releasing the letter on Friday night. Merrill criticized the senator for releasing it and called it "playing politics with our national security" and a "disgrace." Merrill confirmed Clinton sent the letter in response to Adm. William McRaven's criticism of Trump revoking Brennan's clearance. "Back in August, Admiral William McRaven penned a letter in the Washington Post in the aftermath of Trump revoking @JohnBrennan’s security clearance," Merrill tweeted. "In his letter, he admonishes President Trump for this petty act, and says that Trump’s time as President has “embarrassed us in the eyes of our children, humiliated us on the world stage and, worst of all, divided us as a nation. Who is Admiral McRaven? A partisan? No. He headed Joint Special Operations Command during the rescue of Captain Phillips. He was the architect of the raid that killed Osama Bin Laden. A prominent Republican once said that he had “literally written the book on Special Operations. "Admiral McRaven has served both Republican and Democratic Presidents, and is a man of honor whose service to this country and heroism is virtually unrivaled," he continued. "Secretary Clinton has great respect for Admiral McRaven. She read this message & decided to take the step of voluntarily withdrawing her security clearance, which she maintained after leaving her post as Secretary of State to write her book, customary for former Secretaries."